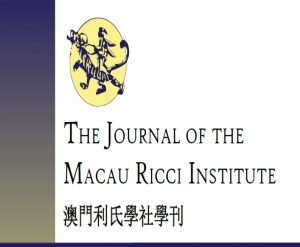 The Macau Ricci Institute has launched a new, bi-annual publication — the Journal of the Macau Ricci Institute. Dedicated as a “Journal of Moral Leadership, Social Innovation and Comparative Spirituality,” the Journal of the Macau Ricci Institute is edited by Stephan Rothlin and co-edited by Dennis P. McCann and Mike J. Thompson. Thierry Meynard is the associate editor for China. Members of the journal’s editorial board are Franz Gassner of University of Saint Joseph (Macau), Yang Hengda of Renmin University (Beijing), Zhou Shoujin of Peking University (Beijing), and Alvaro Barbosa of University of Saint Joseph (Macau). University of Basel (Switzerland), Gael Giroud of Centre Sèvres (Paris), Gerhold K. Becker of Assumption University (Bangkok). More information about the Macau Ricci Institute and its initiatives are available online.